Lori Castañeda is now a sophomore at San Fernando High School and is a member of the DIY Girls 2017-2018 Invent Girls program. 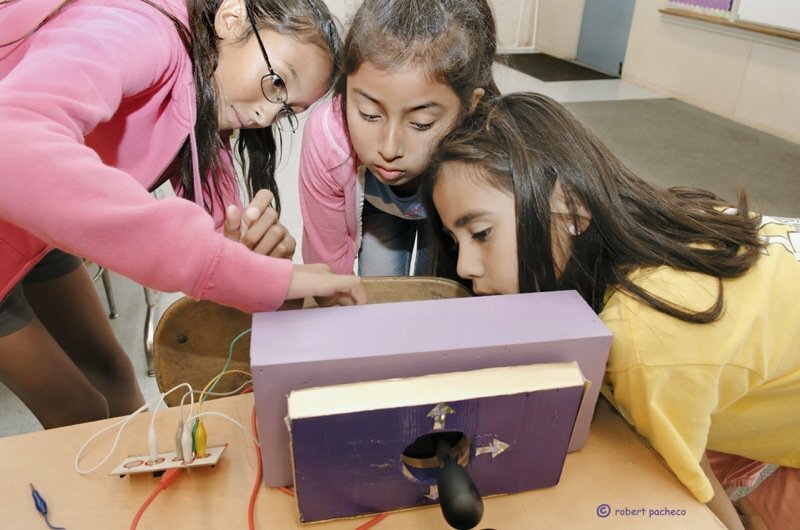 Lori Castañeda (Left) during the first Creative Electronics Program at Telfair Elementary in 2012. This interview was conducted by Ronee Connell, Communications & Administrative Coordinator at DIY Girls on February 7, 2018. 1. What does it mean to be a DIY Girl? LORI: Being a DIY Girl means having a lot of determination and not being afraid of failure because if you don’t fail, then you won’t really succeed. If you do succeed with failure did you really go through all of the situations that you could have faced and if some could have been better then what was really the result? 2. How has DIY Girls impacted your life? LORI: The first time I was ever in DIY Girls was when I was in elementary school in 5th grade with Luz Rivas. Ever since then, I wanted to be a DIY Girl but they did not offer the program at my middle school after I graduated from elementary school. Then, in my freshman year of high school I found out that they were offering a program at my school but it was only for juniors during this time. But this year they opened it up to more grade levels so I was so excited to join it again. I am really loving the program. 3. Has there been a specific peer or instructor that has influenced you for the better while being involved at DIY Girls? LORI: Luz Rivas. Knowing that she attended the same schools that I attended when she was my age, Telfair Elementary School, Pacoima Middle School, and San Fernando High and also knowing that she is a Latina. Seeing her get so far in her career allows me to know if she can do it, then I can do it too. 4. What DIY Girls team are you working on now? What project are you working on? LORI: I’m in the Invent Girls program now. I’m on Team ADVRand we’re working on a product that is similar to a Roomba vacuum but we’ve made slight modifications so that this one will be able to fit into air ducts. Our main focus is on air quality, and more specifically indoor air quality. Professionally, to get your air ducts cleaned it will cost you $300-$1,000 and for low-income communities, this would be difficult for them to afford. We’re making this Roomba-type product with sensors all over so that it would know where to go and we’re going to be programming it ourselves. Right now we’ve already made a model that later we’re going to create using a 3D printer. Basically, we’re designing everything from scratch. To program it, we’re going to be using the Arduinos, which is a board that you connect and make it function. We’re also connecting brushes to the side of the product so that it can clean the ceiling of the air ducts. LORI: My favorite memories are from the elementary program because that is where I learned what a circuit board was, how to solder, and the basics of engineering. That’s where everything started for me - that’s like the root. 6. Do you know where you want to go to college yet and what you want to study? LORI: I don’t know where I want to go yet, but in the future I do want to be a doctor and possibly major in Biology, Psychology, or Chemistry.